Once logged on, tap FILES on the Syncplicity for Android main menu or navigation bar to view the top-most folders and files. Tap a subfolder to go deeper into the folder hierarchy. Swipe right quickly to go back up. Swipe left to right to drag the top-most sheet. This allows you to see more or less of the folder hierarchy. Inside a folder, you can see additional subfolders and files. Top-level folders, subfolders, and files have different contextual actions. To quickly move out of the folder navigation, tap the hamburger icon (at the top) to open the navigation menu. Syncplicity allows you to share folders with other Syncplicity users or groups. When you share files or folders, you are giving recipients access to them. When you share a file, only that file is shared. When you share a folder, all the files and folders within the folder are shared. Grant editor or reader permissions to recipients when you share a folder with them. An Editor can add or change content. A Reader can only view content and can only grant Reader permission to any user they share your folder with. Change permissions or remove any recipient (even those you did not invite directly). Permanently delete any subfolder or file in a shared folder. Recipients can share your folder with others; although, they can only change permissions or remove the users they invited to share your folder. 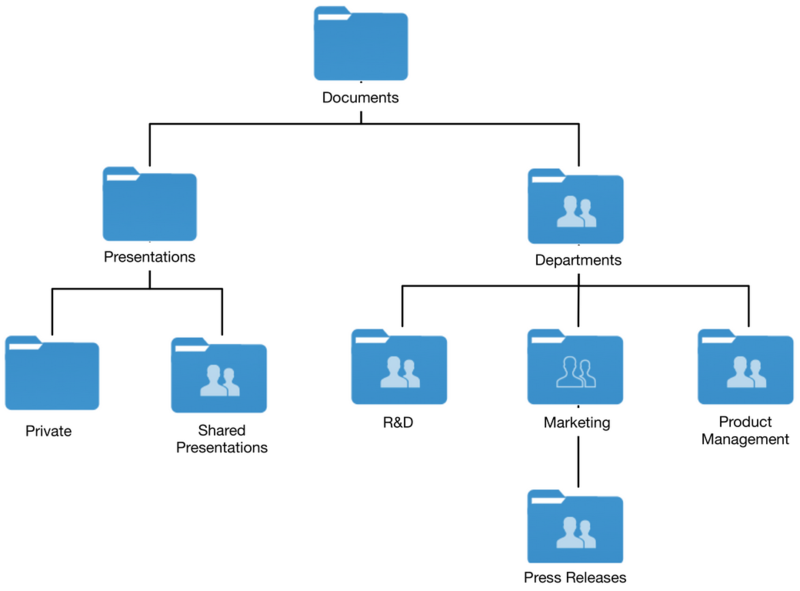 Syncplicity allows you to share top-level folders or any subfolder in any hierarchy. The following graphic demonstrates how sharing a folder is applied to recipients. Two subfolders of Departments (R&D and Product Management) are shared explicitly. The Marketing subfolder under Departments is not explicitly shared, but is accessible by users who have access to the Departments folder. The Press Releases folder can be explicitly shared with external parties without sharing the Marketing folder. This gives the external parties access to only the Press Releases folder. When a subfolder is shared with a recipient, it inherits the highest permission of the parent folder. For example, if you have shared the Departments folder with a recipient that you have granted editor permissions and the Product Management folder you have granted reader permissions, the Product Management folder inherits the higher level Departments folder's editor permission. It is important to understand that you can share a subfolder of a parent folder that you do not own (as long as the owner of the parent folder allows subfolder sharing) and can also share without sharing its parent folder or a sibling folder. Subfolder of a shared folder, not explicitly shared with the receiver.